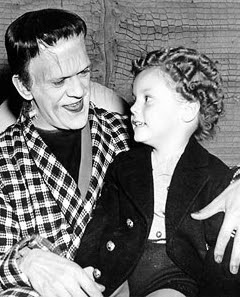 He was the four-year old son of the Son of Frankenstein (1939). He is the last surviving actor to have played opposite Boris Karloff’s Frankenstein Monster. Donnie Dunagan, now 73 years old, has put his personal collection of memorabilia up for auction. These unique and important items include photos, contracts, letters, pay stubs, scrapbook pages, and a wonderful autographed still of Boris Karloff signed “with love from the giant”. The auction goes live on October 6. Info via Tim Lucas' Video WatchBlog. Essential reading! Also on the Heritage Auction site: Monster masks used as props in Abbott and Costello Meet Frankenstein (1948). 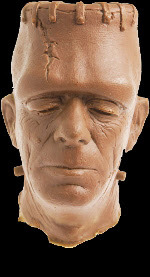 A vulcanized rubber Frankenstein stunt head, a perfect likeness of Glenn Strange, appears surprisingly well preserved for its age and one suspects it might be a more recent “pull” from the original mold. Nevertheless, it is a stunning piece. Right in time for Halloween, here’s an exhibit of classic stills from the great Universal Frankensteins. 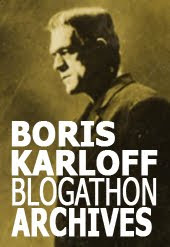 Rutgers Student Center in New Brunswick, New Jersey will be displaying Frankenstein Pictures: A Photographic Tribute to Boris Karloff and The Frankenstein Monster from the collection of Ron MacCloskey, October 14 to the 27th. 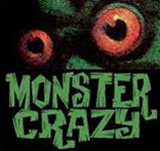 Check the Creepy Classics website for all the details.